In an era when users simply collect and store the data from anywhere at any time, whether it is an issue with efficiency, effectiveness, or accuracy in analyzing the data, at Winmate we understand how much you care about your working performance. That is why Winmate Communication has introduced the M185D 18.5” P-Cap Panel PC, which combine high performance and such elegant contours. The M185D with Intel Atom N2600’s dual core is the state of the art industrial panel PC with a 1000:1 contrast ratio that provides 1366 x 768 resolutions. Optional power input from add-on battery and/or PoE (Power-over-Ethernet) gives users a safer solution to prevent possible data loss or system damage from sudden cut-off of power supply. 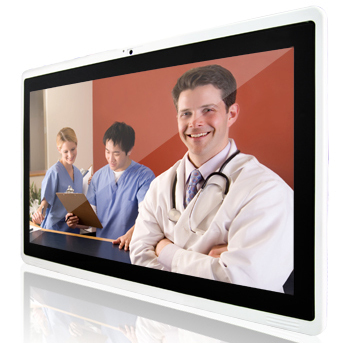 The device is also equipped with P-Cap multi-touch screen makes the user-device interaction easier. Weighing less than 4.2 kilogram with compact design and being just 35 millimeter thick, M185D can be mounted just about anywhere. Fanless operation as well as IP65 front panel sealing is perfectly suited for hospital and healthcare environments. Winmate M185D panel PC is all about Idealized medical solution, with built in smartcard reader, M185D protects data from non-authorized activities. Optional barcode or RFID reader can speed up medical staffs’ daily work.